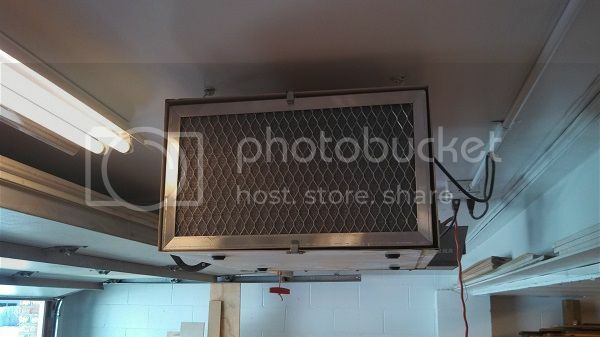 I have a Jet AFS-400 Air Filter mounted on the ceiling in my shop. I like having it, but I was frustrated with the stock pleated filters. Air Filters Inc out of Nevada. They’ve got a nice website. I priced out the size I needed and was happy to find it would be about $40 shipped. That’s not much more than the Jet pleated filters. Order one I did. Air Filters Inc. states custom order will take a couple weeks. I believe it was at my door in about 12 days. It exceeded my expectations. The filter frame was obviously custom made, with a nice aluminum frame riveted at the only seam. The actual filter is reinforced and stout. The website said to allow a tolerance of 1/8” for custom sizes. My order was dead on the measurements I provided. I’ve been running it for a couple weeks now and had the chance to wash it today. You can see the nice drain holes in one of the pics above. This is soooo much nicer than blowing or vacuuming a pleated filter. I should have ordered one of these a while ago. I still have to clean the inner sock-style filter from time to time. But the outer filter catches most of it anyway. For those who don’t have a shop air filter, there are all kinds of folks on LJs who have made their own. 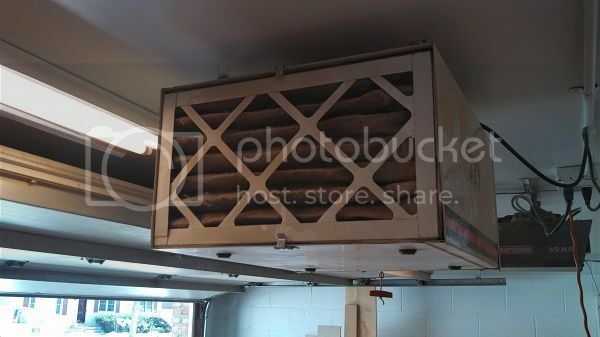 They are essentially a box, a blower fan, and a couple filters. 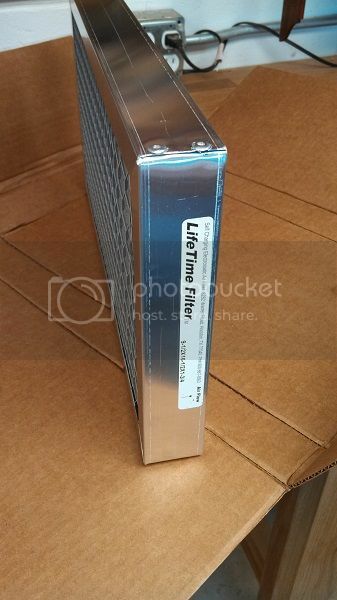 A guy could probably order a standard size of these filters and build the box accordingly. I thought it might help someone out there….so I shared. Thanks for the review on the filters. I am planning to build my own system and think you should buy standard size filter that are used in “store bought” units. Just makes sense to me to do that. I first thought I should got to ACE hardware and buy some filters but I am rethinking that now. I can get Wynn filters for about 10 each. I am thinking I might get one of these washable filters like the one shown then get the another filter under it then the bag type filter. I am thinking this is the way to go after some reading. Favorited for future reference – thanks for posting. Red, thanks for taking the time to post this. I have the Jet AFS-1000B and will likely look to this for an eventual replacement of the bag style filter. I’ve washed it once; seems okay, but it is not designed to get completely cleaned out since the wet dust can only go to the bottom of the interior enclosed bag sections. I have a very similar filter that happened to come on an old JDS unit I bought off Craigslist several years ago. They are fantastic – they keep the inner filter much cleaner and are very easy to rinse out and drain and dry. Delain, this isn’t a replacement for the inner filter, and I wouldn’t wash the inner; the felt is designed to filter better with some dust on it, so I would just shake it out or maybe vacuum it once in awhile. Red—I have a Rikon air filter and have the same problem you mentioned. This might be just the ticket. Great info, thanks for sharing, I’ll have to favorite this one for future reference. I have several of these filters and I bought them from the same people in Nevada several years ago. More of a finer dust will pass through these than a pleated paper filter ( I was told this by the people at Air Filters Inc.) but in the long run they are cheaper than continually buying disposable filters. I have two Jet AFs400 filters in in addition to three homemade squirrel cage filter units. I do believe I will get one for my furnace since the disposable ones are $35 a pop. Thanks for sharing, I have been looking for one of these. I have the same jet model air cleaner. What dimensions did you give them to custom order the filter? I have been using disposable filters from H.D. which are $4 each they fit, but barely. Cool. I’m glad others found it helpful. larry10- I just ordered it the 9 1/2”x16 1/2” x1 3/4” like it said on the old filter. It has plenty of room around the sides. You could probably order closer to the literal opening, but then you run the risk of it not fitting.